I was not concerned with the limited variety in the three-day detox. In only three days, I knew I would not get tired of eating the same food. 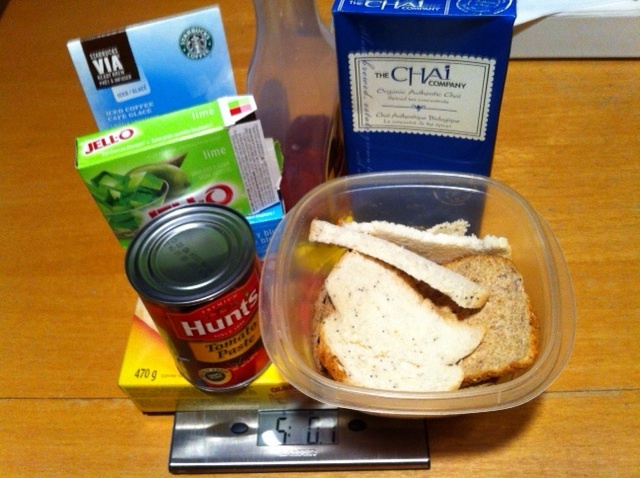 Besides, the dinner included three different choices, so I ensured that I had the ingredients for all three choices. The lunch even came with two different choices. Again, I made sure I had the ingredients for both choices. I need not have worried. The Sea-Veg Salad is a delicious salad that results in a large batch to enjoy over a couple of days or to take to a potluck! Lunch consisted of the Sea Veg Salad (page 182 of Laine’s cookbook, Real Life Vegan: 10 Weeks of Complete Whole-food Meals with Gluten-free, Vegetarian, and Meat-lover Variations!). Fortunately, the recipe makes quite a large batch. This was critical as I found out that I loved that salad! Furthermore, my eldest son (25 year-old) also dished himself up a few servings. This is one of the recipes that I have made quite frequently since the detox. It has even been a big hit at potlucks. It’s easy to make, results in a large batch, and tastes delicious. 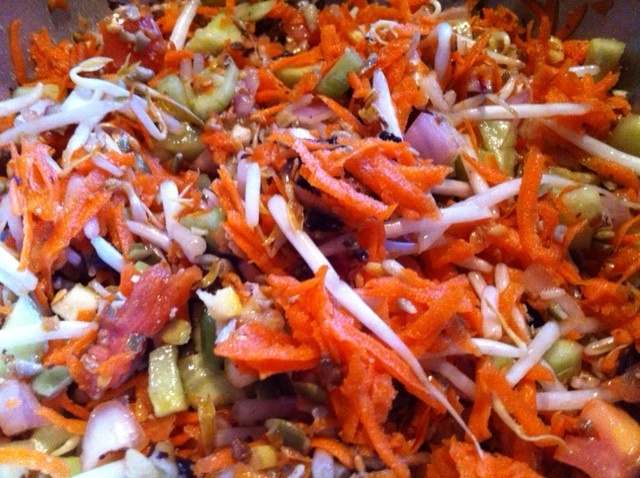 Even though I had the ingredients to make the Nutty Ginger Coleslaw (page 140), I found I enjoyed the Sea Veg Salad, and had plenty of it, that I felt no need to change to another salad. This saved me time so that I could experiment more with the supper varieties. The Rainbow Salad (page 66) was one of the recipes I had already made in the past (before the three-day detox), so I decided to try one of the other supper choices: Apple-Avocado Salad (page 70). Over the past few years of changing my eating habits, I have found that I love avocados. And this recipe gave me another way to use this delicious fruit. Only four ingredients – avocado, apples, almonds, and onions – plus the dressing makes up this mouth-pleasing meal. You have probably already realized that I prefer meals that require very little preparation and make a large amount of food (so that I can enjoy leftovers, which Laine calls “planned-overs”). 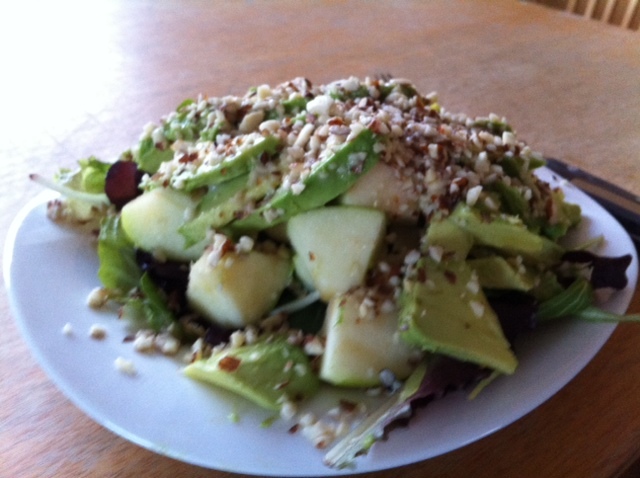 The Apple-Avocado Salad is one of the simplest salads that I’ve ever made. Don’t let the simplicity and minimal number of ingredients fool you though. This salad packs a hefty punch in the taste category. Yet another recipe I have enjoyed more than once since the detox. The third supper choice was Quinoa and Peas Pilaf (page 88). Again, I had been prepared to make this recipe. However, I found out that I enjoyed the Apple-Avocado Salad so much, I choose to eat that for the three days instead. As a result, the Quinoa and Peas Pilaf wasn’t eaten during the three-day detox. I did make this recipe after the detox, and found it satisfying. It didn’t compare to the Sea Veg Salad or the Apple-Avocado Salad for taste. It is simple to make and can be frozen; thereby, saving on time for future meals, which is always a bonus around my house. As with the lunch and supper menus, there were choices for the mid-afternoon snack. Just as with the lunch and supper meals, I found I enjoyed one of the choices for the mid-afternoon snacks that I didn’t bother with the other choices. This delicious choice was the Mint Mojito Cocktail (page 180). The Mint-Mojito Cocktail is an extremely easy drink to make. I took this snack one step further by putting it into a cocktail glass. This elevated the experience to a sit-down afternoon treat rather than just a mere “snack” taken on the run. Taking the time to experience the taste allowed me to feel the sensations as the liquid made its way down my throat: cool, refreshing, tantalizing. I felt special, and this was the perfect way to award myself for the work I was putting into feeding my body the nutrients I deserved. This is yet another recipe that I have made since the detox. It puts the “elegance” into an otherwise ordinary day. Maple Lemonade was one of the other choices for the mid-afternoon snack. It is a recipe that I have on my “must try” list. Maple syrup and lemon juice is a combination I have never tried before. It’s almost too bad that I enjoyed the Mint-Mojito Cocktail so much that I didn’t take the time to experience the Maple Lemonade! Eating real food and eliminating all processed food was the key to my successfully losing five pounds. Since the three-day detox uses real whole food, it is safe to complete on a regular basis. My goal is to complete this detox on a monthly basis. And each time I complete the detox, I can try out one of the choices I didn’t previously make. So I know that I’ll make the effort to try the Maple Lemonade and Nutty Ginger Coleslaw. And just for the record, I lost five pounds completing this detox. See Victoria Laine’s website for more information about her Real-Life 3-Day Food Detox and her upcoming new cookbook, Real Life Vegan: 10 Weeks of Complete Whole-food Meals with Gluten-free, Vegetarian, and Meat-lover Variations!